GALLIPOLIS – After more than 175 years, the white-painted brick home at 809 Second Avenue is gone. The home, thought to have been built between 1825-1840 by John Gee, a skilled African American carpenter, landowner and philanthropist, came tumbling down in less than an hour early Wednesday morning despite the best efforts of local preservationists to save it from destruction. The home was reportedly one of several in the area used in the Underground Railroad to help African Americans from across the Ohio escape slavery in what was then known as Virginia. Speedway, the gas station and convenience store chain, bought the property next to its existing property at the corner of Second Avenue and Pine Street for about $250,000 late last year so that it could build a larger facility. On Monday, its aging facility was demolished. City officials, as well as those from Speedway, say they hope to have the new store operational by July 4. Attempts to save the structure from the wrecking ball by moving it to another location never materialized. City officials had said moving the home would require a variety of permits and other contingency plans, as well as the temporary removal of power lines to allow the structure to safely be moved. 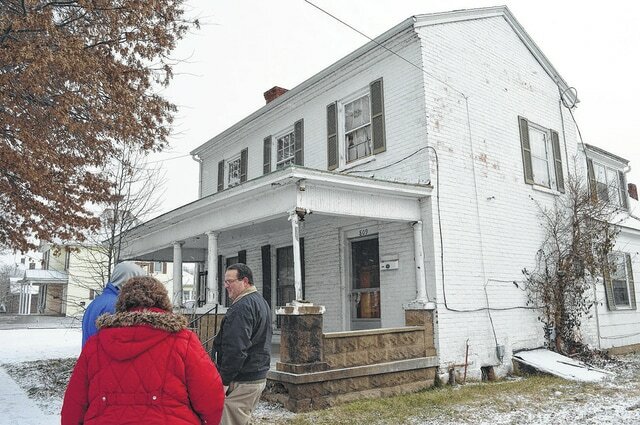 Lora Snow, executive director of the Ariel Theater in Gallipolis and one of the preservationists trying to save the home from destruction, said the house was in good condition and could have been used for a variety of purposes. Despite some of the intricate woodwork inside the home, the house appeared to be in a dismal state as it was left littered with clothing, old computers, a Christmas tree box, papers and other debris from previous tenants. The house was also peppered with rodent excrement and thought to have been infested with termites. Steve Benton, construction site supervisor in charge of the project, pulled a piece of wood from the home and pointed to several examples what he said was termite infestation. That, coupled with the age of the structure, Benton said, would have made moving the building — without crumbling — almost impossible. Benton also pointed to a few scorched spots on several pieces of wood, which he said may have been caused by a fire sometime during its history. It’s that history — not only of the house, but the man who reportedly built it — that Snow and other preservationists wanted to keep. Gee, who moved to Gallipolis in the early 19th century, built numerous structures in and around Gallipolis and used his financial resources to provide local African Americans with more opportunity. A former slave, he established what is now Pine Street Colored Cemetery in 1860 and was known to help other runaway slaves via the Underground Railroad. Local preservationists also claim Gee is the son of William Henry Harrison, the ninth President of the United States. “It’s a tragic loss that we are losing this house, but we want to remember the man who built it,” she said. “He was a daring hero. By day, he was a successful businessman, built houses and laid bricks for the streets in Gallipolis. By night, he was rescuing slaves escaping from across the river. He was a known conductor of the Underground Railroad and gave away food, money, shelter, and rescued countless numbers of people. Work crews demolish the white painted brick house at 809 Second Avenue, known locally as the John Gee House, early Wednesday morning. Preservationists prepare to enter the early 19th century home on Second Avenue in this photo taken March 4.